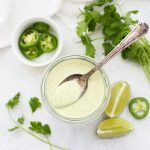 Cafe Rio Copycat Tomatillo Ranch Dressing (Paleo or Vegan!) 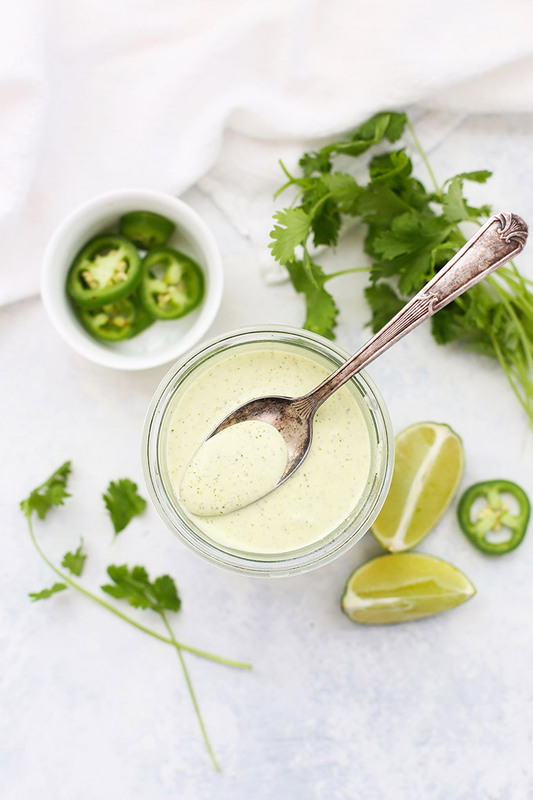 – This creamy tomatillo ranch is perfect with tacos, salads, chicken, and more. Dairy free, gluten free, and delicious! I love summer food. The berries! The watermelon! It’s been hotter than hot (as in, excessive heat warnings hot) lately, and at the end of a warm day, my motivation to cook more or less goes out the window. For heat reasons. Spoiler: This Ranch is Good on Everything. My Top Tool of the Trade. This is a really good job for an immersion blender. It’s my favorite tool for making salad dressings, since the batches are so small. I also use an immersion blender for things like pasta sauce, salad dressings, dips. If you don’t have one or don’t want one, a traditional blender also works! How Much Does it Make? You’ll end up with about around 1 1/4 cups of ranch with this recipe, which is about 10 (2 Tbsp) servings. It’ll keep for about a week in the refrigerator, but if you’re thinking “how would I ever use that much ranch?,” don’t worry. You can make a half batch if you want, but I find it goes quicker than you’d think, especially if you make it for a family dinner or set it out for a casual dinner party (think taco salad bar). Mayo or Veganaise. You can absolutely use your choice of mayo or vegannaise for this recipe, depending on your dietary needs and preferences. Our favorite store-bought mayo is Primal Kitchen (made with avocado oil) and our favorite vegannaise is Just Mayo brand (I get it at Kroger or Sprouts). Both work really well in this recipe. Tips on Tomatillos. You can use fresh or canned tomatillos for this recipe. If you’re buying fresh, look for them next to tomatoes, peppers, avocados, etc. Look for a tight-fitting, green papery husk (rather than a loose, wilted, or grey/brown husk). Otherwise, you can keep canned ones on hand. 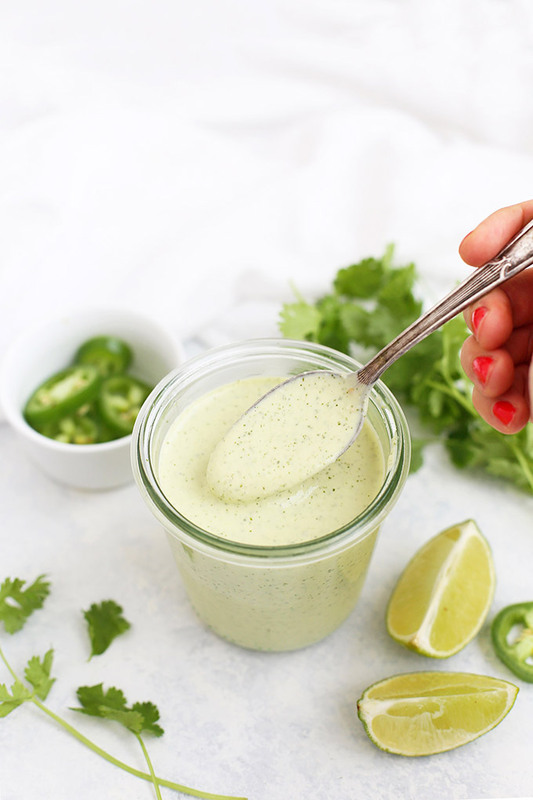 If you can’t find them, you could swap in 1-2 Tbsp of green salsa, or you can leave them out for a cilantro-lime ranch, which will still be very, very good. 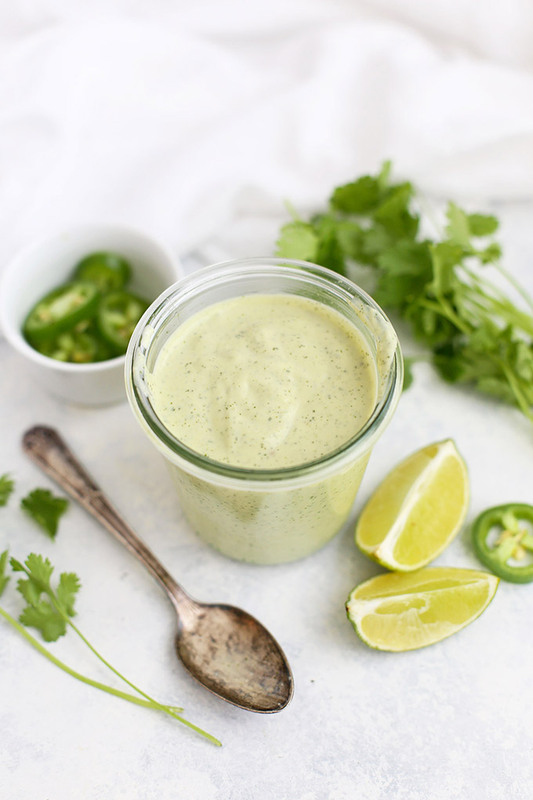 Place all ingredients in a jar and puree with an immersion blender until smooth. Alternatively, you can place all ingredients in a traditional blender or food processor and puree until smooth. If a thinner texture is desired, add a few tablespoons of coconut milk or water. Transfer to an airtight container and store ranch in the refrigerator up to 1 week. Recipe re-tested and re-photographed in July 2018. Originally posted April 2016. So excited to try this recipe!!!! For me, it usually lasts a week in the fridge. When you say coconut milk, do you mean canned or box? Thanks a bunch! Can’t wait to make this! Aubrie – Sorry for the confusion! I usually use the canned coconut milk here since it’s a big creamier. You *can* use the carton kind, but it will be much more thin. I’ll clarify that in the instructions! 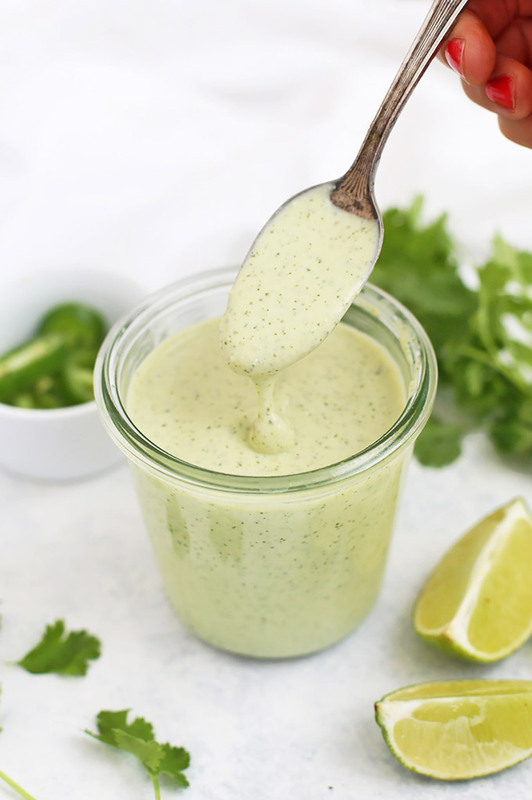 I’m always looking for new dressing recipes, and this one looks yummy! I’m wondering, have you been using fresh tomatillos – and where do you find those? I live in the southwest so it sounds an ingredient I should be able to find, but I don’t recall seeing them. Ellen – I’ve used fresh and canned with great results. I can get canned ones at my local Kroger (Fry’s) often. For fresh, I can find them LOTS of places (Walmart, Target, Sprouts, Frys, etc.) and usually find them near things like tomatoes, avocados, jalapeños, etc. They’re small and there’s usually not a giant display, so sometimes they’re easy to miss! I hope that helps! Thanks! I’m going to look for the fresh ones. Still, it’s good to know that canned will work; I could keep a can in the pantry. 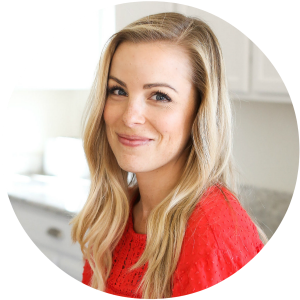 You have gotten me to try new foods and products, which is one of the things I love about your blog! That’s so nice of you to say! I hope you LOVE it! Would it be terrible to leave the dill out? I didn’t notice that and I’ve bought everything else to make them.